This story (Confusion at Sea) was written by a former 1/83rd soldier from B Battery, Larry Rogers. It appeared in the Summer 2017 edition of VietNow magazine and tells of the incident where the LST carrying B Battery north in 1968 sailed too far and into North Vietnam waters. Click here to view that account. "As the XO of "B" Battery, I too was on that LST along with Cpt. Newman, "B" Battery Commander. During the night prior to departure from Saigon, our troops. (probably the Ammo Section) loaded a fork lift that did not belong to us without approval or knowledge of any officer. Our first destination was to road march towards the city of Hue which was still in NVA/VC control. Our 200 pound 8" projectiles, along with concrete piercing fuzes easily penetrated the 20 foot thick wall around Hue providing a hole for the Marines to advance. The 1st Cav Division provided our security. On the road march to Khe Sahn, one of our troops sold a pack of cigarettes for $100.00 to a Marine guarding a bridge with one other Marine. Whoever selected our firing position near Khe Sahn must have done it from a helicopter. It was in the middle of elephant grass about 9 feet high. We lowered the spades on the howitzers and plowed the grass in reverse gear. It took about two hours of plowing to get the battery laid and ready to fire." Bill Burke (70-71), Dennis Donati (70-71), Ron Sims (70-71) and Barney Downey (70-71) sent these accounts of when, after over 4 1/2 years in Vietnam, the 1/83rd stood down in May 1971. Click here to view that account. Rick Stevenson (Svc Battery 67-68) sent along this account of an incident at the Ammo Dump in Phu Bai, May 1968. Click here to view that account. Rick Stevenson (Svc Battery 67-68) asked the following question. "I believe that "A" battery was stationed at Nui Dat during Tet. A few days after the attack someone told me that one of the 8" guns was leveled over the berm and fired (with no projectile). They also told me that they "dipped" or did something to get the first powder bag slightly wet. This caused a fireball to roll out from the gun as it was fired. I've never known if my leg was simply being pulled or if there was any reality to this. Could you straighten me out? Thank you." Click here to see Dan O'Brien's (69-70 "A" Battery) reply. Click here to see a picture of this that was sent in by one of our Aussie mates John Blake (1967-131 Divisional Locating Battery). Roger (Koop) Koopman and Dan O'Brien sent these recollections of theirs of the ARVN. Click here to view that account. This history was sent in by Ross Wood who was with the was at Nui Dat with “B” Company 5RAR in 1966-67. A video on FSB Roy in a weekly update prompted the following discussion among several of the guys. It discusses where various firing Batteries were in 1969-1970. Click here to see that dialog. Here is a dialog about the early days at Camp Everett at Nui Dat. Click here. Recently I asked our Aussie and Kiwi members if they could fill us in on who moved into Camp Everett at Nui Dat after the 83rd went north to I Corps in Feb 1968. Click here to see the responses that I have received so far. Recently I asked our Aussie and Kiwi members if they could fill us in on chemicals sprayed in the area of Nui Dat (Phuoc Tuy province). Click here to see the responses that I have received so far. Dan O'Brien sent this account of where he witnessed a Cobra Crash at FSB Blaze and its results. Click here to view that account. This section contains recollections from our members of their "Coming Home" experiences. Here are more stories of how some of the 1/83rd Vets "acquired" needed equipment. Click here. Gary (Doc) Hill posed a question about a fragging incident that occurred in February 1971 and that in turn brought about a dialog within the group concerning that incident. Click here to view that account. An Aussie, John Hopkins asked about a "Friendly Fire" (as he termed it) incident at Nui Dat. Click here to view accounts of that incident. Dan O'Brien (68-69) sent this account of "A" Battery experiences at FSB Arrow in April 1969. Click here to view that account. Roger (Koop) Koopman, Dan O'Brien and Larry Richins sent this account of "A" Battery experiences at FSB Arrow in 1969. Click here to view that account. Dan O'Brien sent this account of "A" Battery experiences at FSB Bastogne in 1969. Click here to view that account. Dan O'Brien sent this account of "A" Battery experiences at FSB Blaze in July 1969. Click here to view that account. Dan O'Brien sent this account of "A" Battery experiences at FSB Cannon in May 1969. Click here to view that account. Roger (Koop) Koopman sent this account of experiences at FSB Currahee in 1969. Click here to view that account. Neal Schwartz sent this account of action at Fire Support Base Mary Ann in March 1971 where our Captain Virtis Savage was awarded a Silver Star for his actions. Click here to read the actual article published in the March 2011 edition of VFW Magazine (Courtesy of the VFW). Click here to see pictures (then and now) and recollections of FSB Roy. Click here to read reminiscences of FSB Roy, FSB Tomahawk and more from Tony Georgakis (69-70). Dan O'Brien (68-69) started this interesting dialogue on fuses on the guns. Click here to view that account. George Benham (67-68) sent along this account of some of his experiences with "B" Battery. Click here to view that account. Bill Labhart (68-69) sent his recollection of the helicopter crash that killed Col. Richard Pohl. Click here to view that account. There was a story in the February 2011 issue of the VFW magazine about the 1971 incursion into Laos (Operations Dewey Canyon II and Lam Son 719). The 108th Artillery Group and XXIV Corp are mentioned in this story. This story prompted a dialog within our group. Click here to view that dialog. Click here to read the actual article (Courtesy of the VFW). Gary Keck (69-70) sent this example of a Laundry Receipt from the local Vietnamese laundry. Click here to view. Neal Schwartz (68-69) sent along this account of some of his experiences with "B" Battery. Click here to view that account. Jim Gannon (67-68) shares a letter he received from the US in 1967. The family who wrote the letter did not know Jim, his name was apparently selected by folks at home. This shows that there were people who supported us. Click here to view. Calvin Loftis sent in this recollection of the trip from Long Binh to Nui Dat and our first days at Nui Dat. Click here to view that dialog. Wally Wallace (66-67) sent this Christmas Menu. Click here to view. Gary Keck (69-70) sent this Christmas Menu. Click here to view. 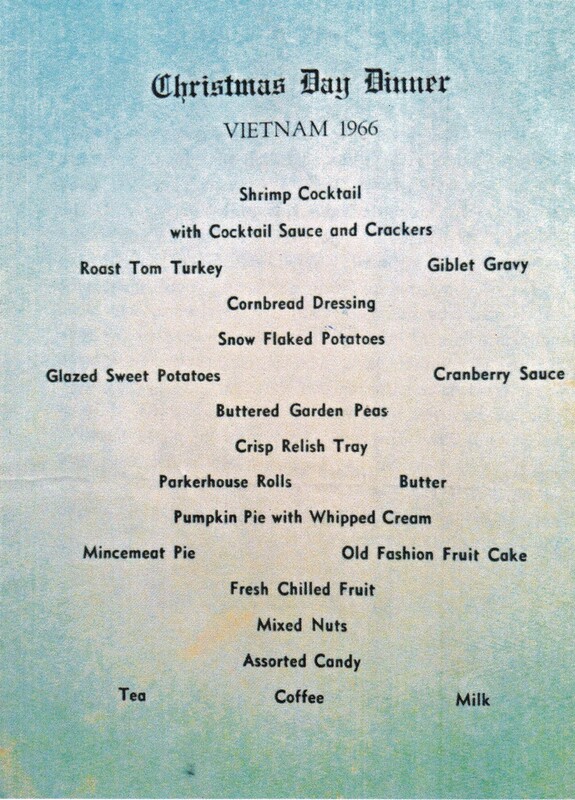 Gary Keck (69-70) sent this Thanksgiving Menu. Click here to view. Winfred Langley (66-67) sent this Thanksgiving Menu. Click here to view. Mike Jalone sent this excerpt from a diary he kept on his tour of duty in 1967-68. Click here to view. Read the story of how some industrious members of the 1/83rd attempted to solve a problem in Ammo handling in early 1968, it is a great tale. Here is the story. This story, written by Brigadier General Richard F. Allen (US Army Retired), was recently published in the 2018 edition of "Army", the magazine of the Association of the United States Army. Click here to read. Click here to see Don Eikenberry's pictures of a 5-ton wrecker and other equipment used at Nui Dat. Don Donaldson, Bill Taggart and Ken Skornia share some stories from Nui Dat in 1966-67. Click here to view. I recently had an interesting dialog with Dave Ellis from the 41st Signal Battalion in 1967-68. Dave was stationed at Nui Dat with the Aussies and spent some time at Camp Everett at Nui Dat. He shared some interesting stories that I think you will enjoy reading. Click here to view that account. Paul Dickson, Ernie Newbold and Bill Taggart share this account of the Nui Dat area and Luscombe Field. Click here to view that account. Calvin Loftis (66-67) recently asked a question about a Mortar Attack at Nui Dat in 1967. Click here to view that dialog. "Interesting article regarding the alleged attempt at pilfering a 5 ton wrecker by 1/83rd-----I remember being already on the LST 281 when the truck almost got loaded. Reminds me of an episode at Camp Eagle when a staff sergeant and SP5 had both finished their tour with the 1/83rd (about July, 1969) but had both extended their stay in Vietnam by 6 months transferring to separate units in Bien Hoa. Discussion (possibly alcohol was involved) ensued, the SSG had some fear of flying, and decided that it might be more fun to borrow a Jeep and drive there. A soldier from 1/83rd made his way across the swamp down by the HQ showers to the 101st Airborne motor pool, "requisitioning" a Jeep. The 1/83rd motor pool guys painted different unit identifying numbers etc. on it, and prepared a fake vehicle log to go with it. Early the following morning, the departing 2 GI's loaded all their worldly belongings in the Jeep and headed South, ultimately arriving in Bien Hoa 3 or 4 days later. The SSG kept the Jeep, as his new unit didn't mind having an extra vehicle. The names of the 2 GI's are not included here as I'm not sure what the statute of limitations is for borrowing/repurposing government equipment, and I wouldn't want either to have their Good Conduct Medals retracted. Interestingly, no more than a week or 2 later, a Stars & Stripes reporter independently thought it would make good press to try to hitch rides on military vehicles from Hue to Bien Hoa to demonstrate the safety of travel throughout Vietnam. Due to closed/uncleared roads and other problems along the way, it actually took him over a month to make the same trip." This is an interesting tale of a C-123 that is claimed to be the most shot up plane from the Vietnam war with over 1,000 hits by May 1969, nicknamed “Patches”. It has a Nui Dat connection as provided by Ernie Newbold and Bob Billiards, two of our Aussie Mates along with Dan O'Brien (1/83rd 69-70). Click here for more. Bill Burke (70-71) sent this account of a strange radio communication that happened while in Battalion FDC Click here to read that story. Bill Burke (70-71) sent this account of an incident when he was an FDO. They had a memorable engagement with the NVA, firing in support of Ranger Team Bills from Co. L, 75th Rangers, 101st Abn Div. Click here to view that account. Ross Wood (Co B, 5RAR) sent this account of his experiences at Nui Dat in 66-67. Click here to view that account. "I told you before I think that driving for Capt. Yore and the stunts he came up with were some of the best and most exciting trips of my life." Click here to read Letter 1. Click here to read Letter 2. Larry Richins (69) and his family took a trip to Southeast Asia in September 2012. Click here to view a travelogue of that trip. Ken Hearon (67-68) raised a question about whether the 1/83rd was ever authorized to wear a 1st Cav patch. This led to some very interesting discussion. Click here to view that dialog. Barney Downey sent me some information about his journey to Vietnam in 1970 that really surprised me and I wondered if anyone else had this same experience. If you did, let me know and I will also add it to the website. "Good to hear that your recent sailing under the Golden Gate bridge was better than the first ...my connecting flight from San Francisco to Oakland , in 1970 was on a large commercial helicopter, at night! A very short flight but pretty spectacular with all the lights on the bridge and the low altitude flight ...actually was my first helicopter ride of many to come." "Hi Barney. That must have been an interesting flight, how did you wind up on a helicopter?" "That’s what I was asking myself, when they put us on a helicopter from San Francisco to Oakland. It was all part of my ticket from Detroit to Oakland. I think the Army booked the flights back then, I don’t remember. However, I just looked this up and I believe it was this service. It was a Sikorsky Helicopter, that’s an unmistakable sound that I remember. It was quite an end to a long flight and the beginning of many. With all the lights of the bridge and this huge chopper in the evening hours, it was quite the memory though." "This is really fascinating, was it just military when you rode it or was it commercial? So you got off a regular commercial airline flight and right onto the helo? I wonder if any of the guys had the same experience, I'll have to ask." "No, it was a regular connecting flight to take me on to Oakland, I think it was American Airlines, nonstop from Detroit to San Francisco and then this commercial helicopter to Oakland. Something else that just came to memory was meeting a pretty stewardess on the American flight, that sat down and talked with me. Since this was a skeleton flight, only 1 seat each aisle taken at the most, she even brought me a beer! When I told her I was heading to Vietnam, she said that I reminded her of her little brother, then she came back with her name and address and asked me to write to her and keep in touch! It was a pretty pleasant experience and flight, to say the least! I would venture to say that a lot of us heading to Nam at that time had that same experience with this connecting helicopter ride, based on this wikipedia info and years of operation. Ironically they filed for bankruptcy about the time I passed through there! Maybe a polling of the group would have had the same connecting flight, as you stated?! Some of these files may be in Adobe PDF format.